For Ralph Sampson, being selected as one of this year’s Basketball Hall of Fame inductees came as something of a surprise. That’s because he is well aware of how his hoops career has generally been perceived — one of great promise that ultimately went unfulfilled, his potential to join the likes of Wilt Chamberlain, Bill Russell and Kareem Abdul-Jabbar in the pantheon of great big man falling flat thanks to bum luck and injury. He came to grips with that long ago. “The Hall of Fame is something I didn’t really spend a lot of time thinking about,” Sampson told Sporting News back in February. “It is surreal to me, just the thought of it. You know, I don’t feel like I got to play out my whole career the way I would have liked to — I didn’t get to put in all the games and all the wins and all of that. Sampson will forever have a place, without question, as one of the most-hyped young prospects in basketball history, coming to the national forefront as an ultra-athletic 7-foot-4 center who averaged 16.9 points and 11.4 rebounds in four years at Virginia. He was the No. 1 pick in the 1983 NBA Draft, chosen by the Houston Rockets, and easily won Rookie of the Year in 1984. He was an All-Star in each of his first four years in the league, averaging 19.9 points and 10.5 rebounds. 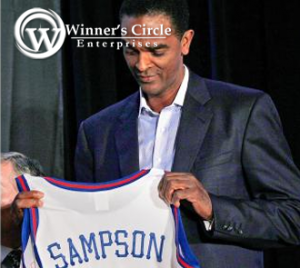 But it was during a game against the Celtics back in March of 1986 that things began to go very wrong for Sampson. He was undercut going up for a rebound, and landed awkwardly, his head hitting the floor. He was taken off the court on a stretcher, and missed the first three games of his career. The following fall, Sampson hurt his back and his hip, and those injuries caused him to limp. That, he believes, is what eventually led to the knee problems that would require three surgeries. He played just 43 games in ’86-87, and over the final six years of his career, he averaged just 35.5 games per season. He was only 31 when he retired after playing 10 games with Washington in ’91-92.